One offer: free eye exams and glasses for "any NFL referee in need. You know who you are." New Orleans Saints wide receiver Tommylee Lewis (11) works for a coach against Los Angeles Rams defensive back Nickell Robey-Coleman (23) during the second half the NFL football NFC championship game Sunday, Jan. 20, 2019, in New Orleans. The Rams won 26-23. A sportsbook in New Jersey is refunding bets on the New Orleans Saints game, and eye doctors in Louisiana and Texas are offering free exams to NFL referees after the team's controversial loss Sunday in the NFC championship game. 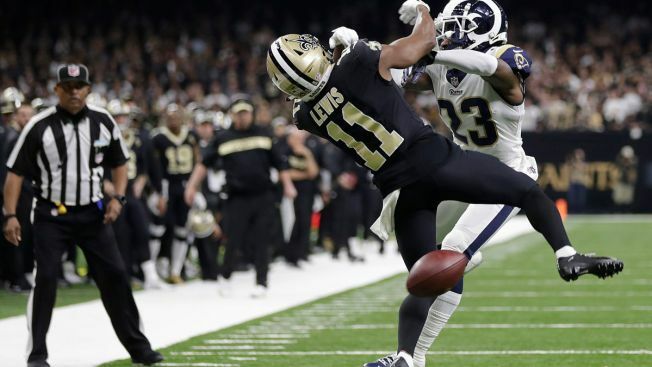 PointsBet said Monday it will refund spread and money-line bets on the Saints, who lost the game after officials failed to call a penalty on a Los Angeles Rams defender who leveled a New Orleans receiver long before the ball arrived. The company announced what it calls a "Good Karma Payout" due to an unlikely event that swayed the result of a game. PointsBet did not say how much the refunds will cost the company. Meanwhile, eye doctors in Covington, Louisiana and College Station, Texas responded to the loss by offering free exams to referees. Louisiana Family Care, noted in a Facebook post that it would "gladly provide no cost eye exams to all NFL officials prior to next season to prevent the atrocity that occurred tonight. We would hate for someone else to feel our pain." Crystal Vision Center similarly tweeted an offer for free eye exams and glasses for "any NFL referee in need. You know who you are." In light of the atrocious lack of calls during the New Orleans Saints game we would like to extend free eye exams and glasses to any NFL referee in need. Rams cornerback Nickell Robey-Coleman acknowledged after the game he should have been flagged for a penalty. "Came to the sideline, looked at the football gods and was like, 'Thank you,'" Robey-Coleman said. "I got away with one tonight." The Rams went on the win the game, eliminating New Orleans from the playoffs and advancing to the Super Bowl, where they will play the New England Patriots.